I will be very surprised if we win the 2014 AFF Suzuki Cup, and not just because our Philippine Azkals were sucker-punched three times by the Thais last night in Bangkok. After having the feel-good restored in two friendlies against lightweight opponents Papua New Guinea and Nepal, with the Suzuki Cup a fortnight away it was time to step up the preparations with a match against a higher calibre team. If anything, however, it was the matches against PNG and Nepal that raised doubts about our chances. Neither of these two teams possessed much quality at the attacking end. Yet both still managed, albeit on rare occasions, to create awkward situations when the Philippines defended with the assuredness of schoolboys. Territorial and possession statistics, I would surmise, have been better than anything that we had during the Simon McMenemy and Michael Weiss eras. Neither of these wins matches, however. At the end of the day, the aesthetics have to be converted into chances and, crucially, into goals. The first half Mark Hartmann show against PNG, of course, was awesome. What was not was the failure to score in the second half as, indeed, we supposedly had the quality on the night to see off PNG with a rugby scoreline. The weaknesses of the squad are there for all and sundry to see, particularly last night in Bangkok. That said, the depth of the squad, the competition for places and the squad’s relative youth cannot be understated. Nepal as an opponent was an improvement over PNG; but not by an awful lot. Yet, it took a late show to replicate the scoreline we had over the same opponent earlier in the year. Of course, last night, one telling statistic was that our only shot on target in the first half came off a Thai head. While last night the main problem was the abject lack of quality with the final ball – and nobody seemed to have heard of the art of crossing the ball – in the other two matches – Hartmann aside – we had lacked quality and composure in front of goal. For reasons I have no knowledge about, our erstwhile most lethal striker Phil Younghusband has suffered a dip in form during the Thomas Dooley era. He continues to add to his own phenomenal goalscoring record; but recent goals have rather tended to come from spot kicks. It has not helped that he has been played all over the place. I can understand it if the thinking behind this is to relieve him of the striking burden; but I am still not sure that this is the right thing to do. Although he has been around as though forever, Younghusband is still only 27. His best striking days, I am willing to wager, are still ahead rather than behind him. I just pray that these days come in a fortnight when we open our campaign in, of all places, Hanoi. My biggest concern, however, has been the wide open spaces we leave behind when we go forward, enough to kill a man with a cardiac condition if I am being honest. Well and good if we can pass our opponents to stupor like Pep Guardiola’s Barcelona. But with the players that we have, there is always bound to be one who will make an error even with a rudimentary 10-yard pass, which then opens us up to rapid counterattacks. The ease with which Thailand carved us open to score their goals last night, for instance, was worrisome. Personally, I am prepared to accept ugly football if we can win everything as opposed to playing pretty football without winning anything. Radojko Avramović’s Singapore won four Southeast Asian championships playing this way. His teams were actually dull to watch, particularly when compared to the expansive teams like Thailand. However, in tournament football, Singapore’s defenders under him became stone-cold assassins and all other players experts in denying opponents room to play. Recently, we saw Myanmar play the same way against us in the Peace Cup. In contrast, our players sometimes appear to be advocates of the we-let-you-play-you-let-us-play philosophy. Of course, as I myself had written before, one should never read too much into these so-called ‘meaningless’ friendlies. Singapore’s own friendlies leading to their last Suzuki Cup victory, for one, were not particularly encouraging. 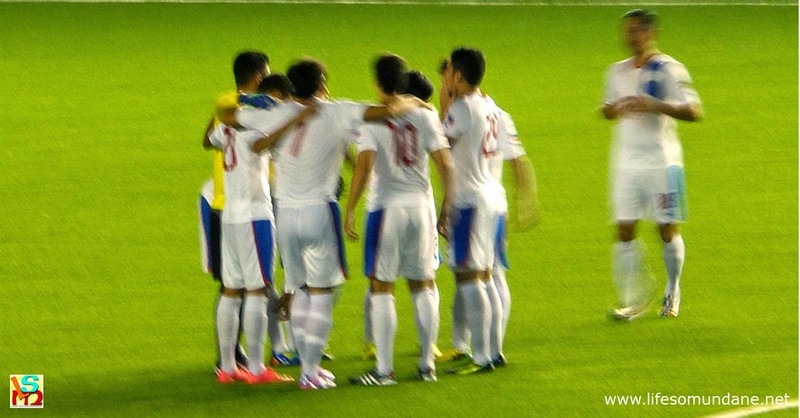 In fact, they even contrived to lose two consecutive international friendlies against the Philippines. The simple truth of the matter is that the landscape changes the moment the Suzuki Cup kicks off. I would love nothing more than for Dooley to prove me wrong; and he has shown particularly in the Challenge Cup that, like Avramović, he knows how to play a tournament. Even if I am not feeling particularly optimistic about THIS Suzuki Cup, my gut feel is actually that we are on the verge of winning it in the near future. The beauty of the Suzuki Cup, of course, is that it is played every two years. Amani Aguinaldo, Daisuke Sato, Patrick Deyto and even Jeffrey Christiaens and Mark Hartmann, to name a few, are practically babes in diapers as far as international football is concerned. There is a Suzuki Cup in the near future waiting for a Filipino hand to claim it. I am not counting on it, but if it can be this December, I will be ecstatic!